Lestestia Eason began working with HHS in August 2016 as a cashier in the cafeteria of a specialty hospital in Bossier, Louisiana. In 2017 she was promoted to the role of supervisor, and in August 2018, just two years after starting with the company, she was named as culinary director for her facility. 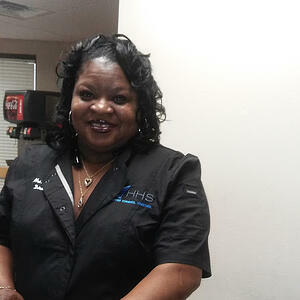 Before joining HHS, Lestestia worked as a dietary supervisor at a retirement center in Shreveport, Louisiana. While there, she oversaw 15 staff members in five kitchens, and was responsible for creating staff schedules and ordering food. Lestestia first entered the culinary field in 1989, and has worked in both front of house and back of house roles, including positions as a dishwasher, porter, cook, ambassador, and hostess. She attended Ayers Technical College, where she studied in the Pharmacy Technician Program, and she is married and has two dogs.